New York City is famous for the Empire State Building and the Statue of Liberty, to name a few but there is another reason why over 40 million people visit here each year, it is one of the best places in the world to shop. You want it, New York will have it. New York is the home of the boutique and with hundreds to choose from you can feel almost spoilt for choice. There are many boutiques selling everything from the weird to the wonderful but these are just a taste of what is on offer. Alexis Bittar and Etro are just two of the many boutiques found on Madison Avenue, where you can spend hours just wandering around these luxurious shops exploring what delights they have on offer. Alexis Bittar has a diverse range of fashion items, with some punk inspired pieces whilst others are simply pretty and feminine. Often genuine stones and expensive precious metals are sewn and incorporated into the designs making Alexis Bittara a must for quality. Etro is a staple for men and woman looking for tailoring but this boutique also has a range of silk and cashmere items as well. The suits produced are a mixture of bright and funky alongside those which stick to more traditional colours; black and grey. For something unique for women visit Cloak and Dagger on 9th street is worth a stop here you will find outfits popping with colour with a ‘good girl’ edge. One of the most versatile types of fashion is Vintage and New York houses enough retro boutiques to keep any vintage-chic contented. Screaming Mimis is an established vintage fashion boutique found on Lafayette Street, displaying a wide range of eccentric, attractive clothing which will appeal to the wild side of any fashion follower. Nestled in West Broadway you will find the aptly named, What Goes Around Comes Around, visiting this classy boutique allow you to admire the glamorous side to vintage shopping with its finely made materials be it leathered, laced or even denim, here you can easily achieve a look inspired by the west. Cheap Jacks is a well-known vintage clothes store on Fifth Avenue, where you will find a vast selection of items for both men and women’s clothing. Once here you can relax on the sofas and even have your alterations made while you wait. With so many amazing boutiques in New York it is easy to see how some can be missed, Shareen is a vintage fashion bouquet hidden off the beaten track. On the second floor of a building in 13 West, 17th street you will find a heaven for those who love vintage ball gowns and dresses with items dating back most of whole of the last century. Situated on Fifth Avenue you will find most of the words most famous luxury designers all in close proximity to one other, you can explore the Italian inspired fashion clothing store, Versace or visit Prada where you can buy shoes, hats, bags and accessories . You can visit Gucci, the store which in 1998, broke the world record for the most expensive jeans, costing around £2000. Dolce & Gabbana will provide you with a range of fabulous suites for men, luxurious outfits for woman and appealing outfits for children. 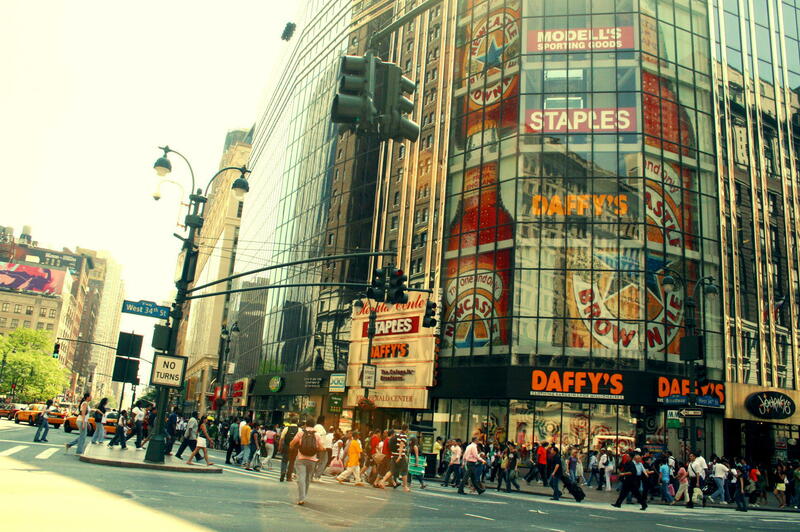 Whilst on Fifth Avenue you will also find a range of high street favourites including, Zara, Gap and Nike. For those who enjoy designer jewellery, Swarovski who sell a variety of crystals, jewellery and miniatures or Tiffany and Company, are amongst the best places to go on Fifth Avenue. Tiffany’s jewellery boutiques blue boxes make it distinguishable in the sea of different designer labels. Whatever you want New York will have it. With more designers than it is physically possible to visit, remarkable boutiques and vintage style, along with the cream of the crop in unique fashion, it is the perfect paradise for fashion fanatics.